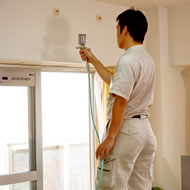 SELFEEL is directly sprayed onto the wall and ceiling with an air compressor. Particular preparation for this application is not needed. Also, furniture does not have to be moved. The work can be easily done in the room where you are living now. It is actually better with the furniture where it is because the effect of SELFEEL depends on the size of the applied area and contact with the air in the room. 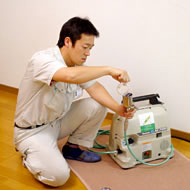 For a room with floor space of 50 ㎡, the application takes about 2 hours. This does not include some minor preparation, such as a short meeting and cleaning prior to the work. You may go shopping while the work is in progress. The work is done by the time you get home. The following equipment will be brought into the site. Furniture can stay where it is since the equipment does not take up space. Upon request at contract, we provide a FREE health consultation by an indoor environmental advisor and a sick house syndrome diagnostician. We offer a free health consultation without contract. Please contact us. The cleaning is done with a blower for deep dusting. Dusting by yourself with a duster can save money. You can do it easily. ・・・・We have been receiving good reviews from this. Organic substance not only in living spaces, but also in cars have been brought into question. Smoking smells stay, and mold odors from the car air conditioner may be bothering you. If you have young children, you may want to provide them with a sanitary car environment. CARFEEL is the solution. Copyright (C) 株式会社山英 All Rights Reserved.